It has been said that necessity is the mother of all invention. If so, I think the combination of laziness and beer must come in a close second. I think the contraption shown here is the most ingenious thing I have ever seen (ya’ know, other than my computer, the electricity making it run and the human body, yadda, yadda, ya…). I ask you, who has more of the aforementioned combination of necessity, laziness and beer than North America’s redneck? 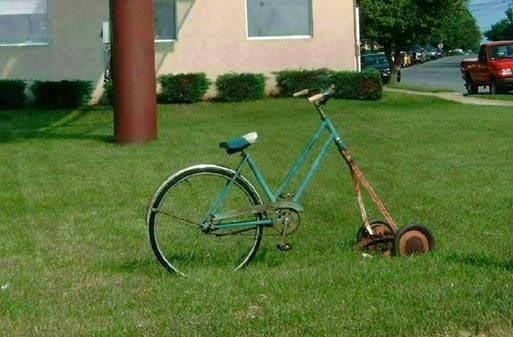 Clearly, a hard-working, hard-resting, God-fearing redneck without the financial wherewithal to acquire some mad-fangled riding lawnmower contrived this beautiful solution. Genius, I tell you. By employing some gears and pedal-power a standard reel mower is transformed into a veritable gobbler of grass (I am assuming, anyway). And during times of recession this is exactly the sort of ingenuity we need. Who do you think invented the brick in the toilet tank? Some Yankee do-gooder? (well, maybe.) What about the beverage koozie? huh? Who knows what great discovery the back woods will release on an unsuspecting world. I can barely breathe for the suspense.